Today’s Drive: Boulder Co to Elko NV, all on I-80. Mileage: 83,680 to 84,442 = 762 mi. Enough for one day, for sure. Synchronicity of the Day (aka Miracle): At a McDonald’s near a gas station where I filled up, there’s free coffee; it’s last day of that offer! That got me thinking. How could I pay it forward during a 12-hour driving day, sitting alone in my little capsule? I like the pay-it-forward idea, responding to kindness by being kind to someone else. It wasn’t until I went up to my assigned room in the motel, opened the door, saw the waste can overflowing with a greasy pizza box and an unmade bed, that I realized my P-I-F opportunity. I dragged my suitcase back to the lobby and reported the scene to the two young women at the desk. They were embarrassed and apologetic. I just said, “Hey, sometimes life’s like that. Stuff happen. No big deal,” and waited to be assigned a new room. No upset. No recrimination. Just letting someone off the hook for an error. And they gave me a better room, instead. *Wide-awake intense joy between 6:00 and 7:30 in the morning with the radiant-white full moon in the west, the orange-pink-gray sunrise in the east, frost on the browning grass, and undulating golden fields running right up to the bluish front range mountains. No wonder they named a town I speed past, Loveland. Who wouldn’t? *Geometry on the farmland: gray-metal cylinders with cone hats; triangles perched atop long rectangles; parallel black lines joined by cross ties; tall trapezoids with daisy-petal spinning circles; wide gray endlessly swath stretching ahead, bordered with white lines…. *Wyoming: Forever West. “Strong winds possible”… “Advise No Light Trailers” …“Gusts 50+”. No kidding, guys? 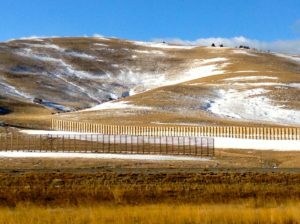 Snow fencing… a pass at elevation 8640… a huge head of Abraham Lincoln overlooking I-80…sagebrush, flat-top mesas, herd of sheep, herd of deer, grazing cattle…green-rock hills, elephant-foot hills… Little America ads: 75c cones, marble showers, spotless restrooms, fresh food, donuts, mechanic, playground, free wifi, truck scales. 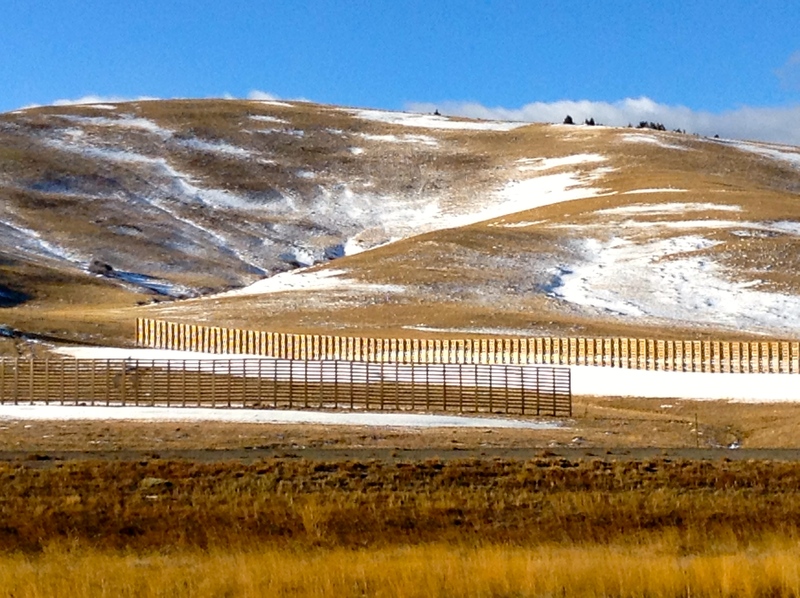 I like seeing the snow-fencing that protects Interstate-80. But how much protection does it really offer? I hear there are lots of highway closings on I-80. 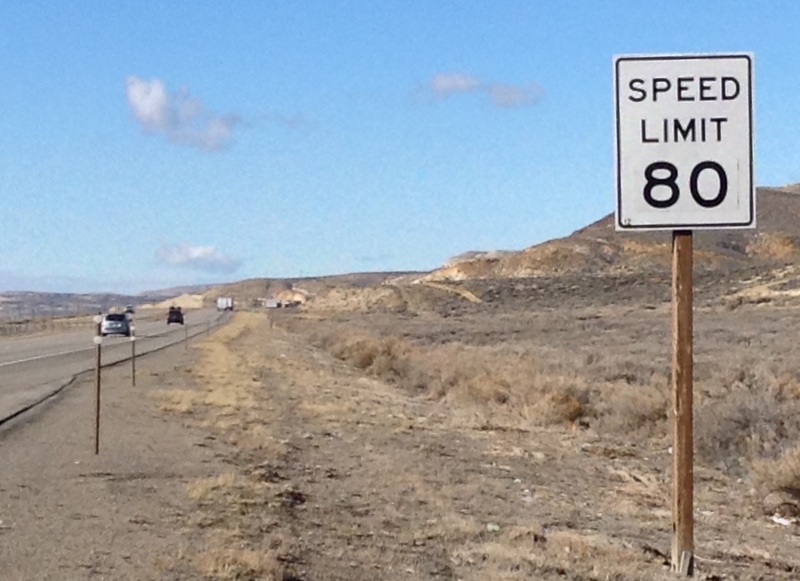 Another thing about Wyoming: Just this year they raised their speed limit to 80 mph on certain stretches of highway. Pretty exciting news for truckers and long-distance trippers, don’t you think. The WYDOT just stuck an “80” over the old “75” on the speed limit signs. *Utah: Pine-covered mountains like the Colorado Rockies…more frequent towns… cowboy on horseback herding cattle. 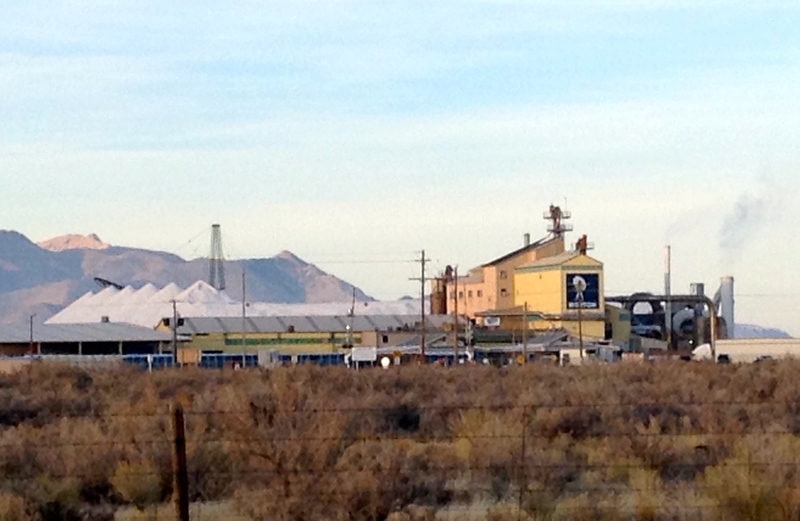 West of Salt Lake City, I see a huge mound of white substance in the distance, beside an industrial building. As I get near, I’m shocked. It’s Morton’s Salt! Note the pointy white hills (a little like the Denver airport) on the left. That’s salt! And don’t miss the little girl with the umbrella logo on the factory wall. And shortly thereafter, I passed a sign for the Bonneville Salt Flats where there’s one of the world’s most famous speedways. (See “The World’s Fastest Indian,” a charming movie about Burt Munro, the quirky, indefatigable New Zealand speed bike racer.) It’s a real place! And open to the public. Next trip, maybe I’ll stop over. *Nevada: It’s dark now. Hard to know what’s on either side of the highway.